Growing up my family and I moved every four years. We went from New Jersey to Italy to Charleston, in the space of 8 years before landing in Pittsburgh where we stayed for 20 years and loved it. We were and are fanatical Steeler fans, we learned to eat French fries on everything including salads and as the youngest child, I embraced the Pittsburgh dialect, which makes the Brooklyn accent sound smooth. The biggest negative in Pittsburgh was the weather. We would celebrate the beautiful crisp fall days knowing that once we got past mid-October we could expect a series of endless, grey, snowy days that would last well into April or May. As winter marched on, we would gather at least once a day at the kitchen window. Just after we moved in, my mom planted a forsythia bush outside that window. When buds started to appear, we knew there was hope that spring would soon arrive. We tracked that tree daily until we started to see the bright yellow flowers that would shift the mood in our house from winter blahs to spring hopefulness. As surely as the seasons change, one morning my mother would announce, “The forsythia is blooming!” She would launch into our springtime activities; cleaning, sweaters pushed to the back of closets and sun dresses moved to the front, bathing suits would be examined to see if they would last another season. When my parents decided to retire to North Carolina we knew we would miss that house and that forsythia. Not able to say goodbye, my mother took a clipping and nursed it on the long drive south. When they arrived at their new home in Wilmington, one of the first things she did was plant that clipping. The forsythia flourished. My mother gave cuttings from the Pittsburgh Forsythia, as it was now known, to both of my sisters and they too are still flourishing. 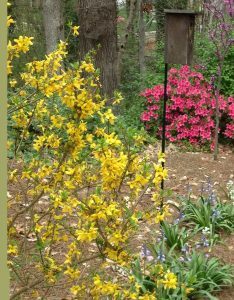 When I moved from New York City to Atlanta, the first thing my mother gave me was a forsythia clipping. When I moved from Marietta to Dunwoody, I did not even think twice about taking a clipping and planting it in my new yard where it has grown to twice the size of the original bush. Pittsburgh forsythia clippings have watched over family from Seattle to Maine and several places in-between. It is hard to say goodbye to our homes so it’s nice to be able to take a little piece of our old home to our new home to serve as a reminder of our past.